Need more information about booking Home 179797 ? This Cottage has 3 bedrooms, 4 bathrooms and sleeps 6. It’s been listed on Holiday Lettings since 21 Sep 2011. Located in Indre-et-Loire, it has 33 reviews with an overall rating of 5. The average weekly rate varies from £682 to £1254. Nice Gite part of small 'community' of gites in quiet country village; not too isolated. Small town,Chatillon within 10 minute's drive has supermarket and other facilities. House clean and well-maintained and equipped. Warm welcome from friendly staff - complimentary meal prepared for late arrival. Excellent,warm covered swimming-pool : good parking. A delightful choice of Gite.! We stayed at The Grange the last week of April and totally loved the experience. The location allowed us to visit many of the chateaus of the Loire. Both the house and grounds were beautiful, surpassing our expectations because one never knows if a place is going to look as good as the pictures. Also, the caretakers, Peter and Dianne, were wonderful hosts from the moment we arrived - even going so far as to have a basket of food and wine awaiting us on that first evening. Their recommendations for restaurants were very good, and Peter even took the men to the nearest supermarket on the first day. We will certainly return if we get the opportunity! This was our long awaited 25th Wedding Anniversary holiday and the best holiday we have ever had in France. Beautiful quiet location, Excellent Gite,Great facilities, fabulous places to visit and super owners. Angela and Derek made the the holiday experience from inquiry to leaving stress free. They answered all our questions and their recommendations for trips and eateries where "on the money". The Grange had everything in it you could want and with the swimming pool and bikes available to complete the holiday experience. We have already recommended this holiday destination and Gites and we are booking again. Can't recommend highly enough! 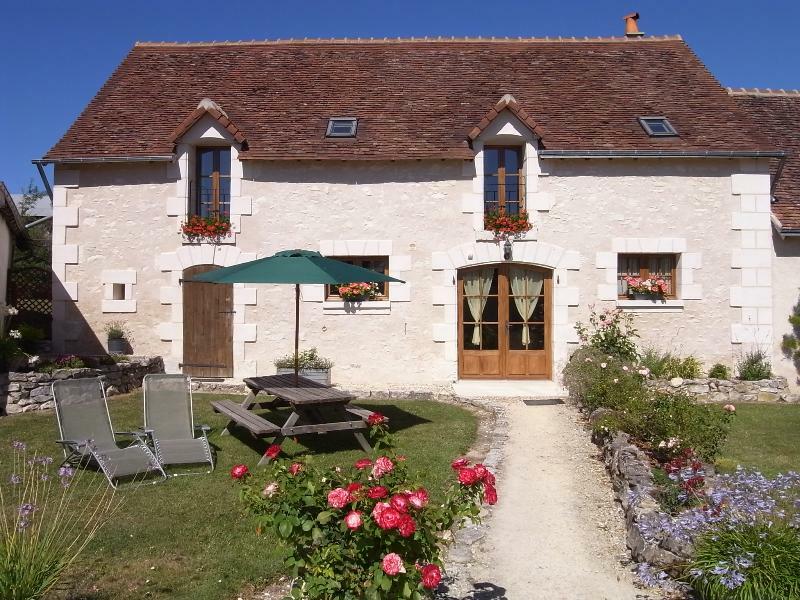 From our first dealings with Angela we realised that this was a professionally run Gite. The initial promptness and enthusiasm to accommodate was to be reflected in the service we received months later from her and Derek at their wonderful farm. The quality of the property was top class with every conceivable facility available within the house and a great range of external options. Just a wonderful place run by lovely people. Go there!!! Our stay in The Grange was excellent , with first class accommodation, friendly and helpful Hosts in Angela and Derek, beautiful gardens , superb indoor pool and every other kind of facillity you could think of to make a wonderful , relaxing holiday. The village is quaint and has a lovely Restaurant serving typical French meals alongside its own Boulangerie and small Epicerie. The area is beautiful with large and small Chateaux within easy reach ,all of which were recommended by Angela and Derek along with other helpful advice to make our stay so pleasant. We were 3 couples so having all en-suites to the bedrooms was a real bonus. The week went far too quickly and we were all very sad to be leaving. We wish Angela and Derek continued success for the future. Angela and Derek were the perfect hosts, friendly and helpful. There are 4 Gites " on site " and it was nice to be able to chat with the other holidaymakers staying there with us. Only a short walk away was a Bakery for our fresh bread and croissants in the mornings. What a treat. Francoise who runs it also serves Lunch/Dinner in the Restaurant adjoining. She is a star, running round, taking orders, serving and of course cooking your meal which was excellent. Angela suggested several places for us to visit including Amboise to see Chateau du Clos Luce Parc Leonardo da Vinci. Good choice and what an experience. Loches is well worth going to too.. Superb Intermarche Supermarket in the next village, just a short drive away. Hope you enjoy your holiday in the Grange as much as we did, thanks to Angela and Derek. The Grange provides well-equpped and spacious accommodation for a family group in the delightful setting of Clere du Bois. There is plenty to do on site, but it is also convenient for visiting many of the Chateaux in this part of the Loire or the Brenne National Park. The hosts could not have been more helpful, making us a reservation at a local restaurant and offering advice whenever requested. A brilliant place to holiday! We had a wonderful week at the La Vieille Ferme. We stayed in the Grange and it was perfect. The place is immaculate and Derek and Angela should be congratulated for their attention to detail. If you need the perfect relaxing week in beautiful surroundings then you've found it here! Highly recommended! Richard &Susan Mather....and family. We have visited La Vielle Ferme twice to-date; on each occasion, we stayed in the Grange with friends. We arrived with friends, and we all left having made new friends. The aptly named Derek and Angela French (yes, they are english!) are the perfect hosts. And let's not forget "Lusy, le Chat " ! From the moment of our first arrival we were instantly at home. Accomodating (apologies for the pun! ), knowledgeable about the surrounding area, and owners of a wonderful set of properties all of which combine to make you feel that your holiday has come to an end a little too soon. The Grange is a highly equipped and versatile property - we have stayed there as a four-some and a six-some - it has a wonderful homely and comfortable feel and invokes dreams and desires to escape the rat-race back home. Settled in quiet countryside away from the slightest traffic noise, and yet within easy reach of diverse attractions ranging from the excitement of Futuroscope, to the tranquility of walks alongside lakes and amongst wildlife, followed by that evening spent in one of many typically french restaurants where we were able to recount our daytime exploits whilst exercising our "schoolboy french" on the evening menu ! Would we return this area ? Absolutely yes! Would we seek somewhere else to stay ? Absolutely not ! I have nothing negative to say about the properties or the owners - our stays have been superbly relaxing and I can't wait to return. We have now stayed in the Grange on several occasions, both as B & B and rental guests. We have found the accomodation to be of a very high standard and the owners to be extremely friendly/approachable and helpful with any requirements.The new pool/garden room & terrace area has enhanced the whole holiday experience further.